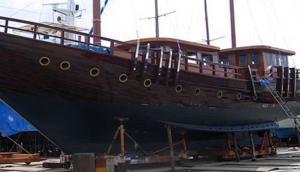 Boat repairs in Phuket have become a relatively easy task with four marinas on the Island and a further three in Krabi, a slipway and various companies well-equipped to service a sailing or power yacht. Equipment is most often readily available with few items ordered from off the island. Both simple and major repairs can be achieved in Phuket by skilled tradespeople to boats that are either in the water or out. Rigging, fibreglassing, electrics and carpentry are just several fields that can be done. Whether your boat is permanently based in Phuket or you are passing through, repairs can be achieved quickly and easily.